The startup of operations at the multi-user dock accounted for the entire increase, with over 5.5 million tons handled, which made up for the drop in shipping caused by the labour dispute at IOC Rio Tinto early in the year. The successful startup of the Bloom Lake iron mine, whose production exceeded projections. Congratulations to Quebec Iron Ore, a subsidiary of Champion Iron Mines Limited. 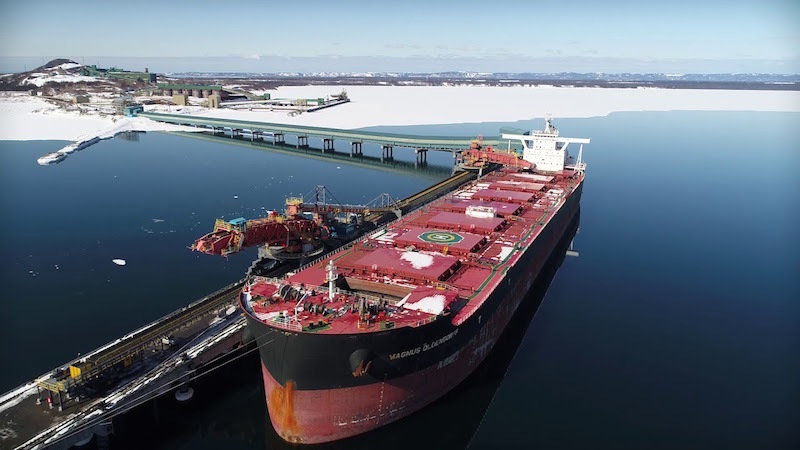 Delivery by Socie´te´ ferroviaire et portuaire de Pointe-Noire (SFPPN) of its conveyor to connect the new dock and the successful startup of its handling and storage operations. Challenges surmounted with aplomb by multi-user dock operator Logistec, in charge of operations and maintenance, and by the Port’s multi-user dock team. The Port made a splash in September with the acquisition of 17 works by local artist Jean-Pier Synnott for display at the Monseigneur Blanche terminal. The outdoor exhibit near the docks provides an additional cultural attraction, not just for cruise ship passengers and tourists, but also for everyone in the Sept-I^les area. Also in September, the Port had to shut down the Pointe-aux-Basques intermodal terminal pending its securing the funds for the necessary repairs and modernization. Pointe-aux-Basques is the gateway for supplies en route to the hinterland and a port of call supplying the isolated villages of the Lower North Shore. Another highlight was the arrival of Tacora Resources in November, which completed its financing to restart the Scully Mine and purchased part of New Millennium Iron’s contract with the Port to become a new user of the multi-user dock. Tacora will significantly increase the Port’s annual volumes, adding a projected 6 million tons per year, and will invest close to $50 million in early 2019 to adapt the SFPPN facilities. In December the City of Sept-I^les and the Port released the results of the Environmental Observatory for the Bay of Sept-I^les’s five-year study, with the data and findings from phases I, II, and III. The data and studies found the environment to be in good condition overall and will serve as a baseline for future protection and management of the Bay of Sept-I^les’s priceless ecosystem. The 2018 cruise ship season clocked in as the second best the Port has ever had, with five ships and 7,960 passengers and crew members. And who could forget the second visit of the Queen Mary 2 in September, along with a visit by Myle`ne Paquette to talk about her perilous Atlantic crossing! Boasting diverse, state-of-the-art facilities, the Port of Sept-I^les is one of North America’s largest ore-handling ports, with an expected volume of more than 30 million tons in 2018. The port facilities at Sept-I^les play a vital and strategic role in the economy of Eastern Canada. Annual economic impacts are estimated at nearly $1 billion and close to 4,000 direct and indirect jobs.